Like everyone else, professional photographers like to take pictures in museums. Whatever your feelings on the matter, it can make for some interesting photographs. Since I found quite a few in the Carter's collection, this is going to be a two-part Photo of the Week with images spanning the 20th century. For comparison, check out a recent installation shot at what is now called the Albright-Knox Art Gallery. Dorothy Norman, Exterior MOMA--Stieglitz Exhibit, 1947, gelatin silver print, ©1998 Center for Creative Photography, The University of Arizona Foundation. Posthumous Stieglitz photography retrospective at MOMA. Erwitt is known for his visual wit - notice how Diana seems to aim her arrow at the guard in the next gallery. You can see some different views of this sculpture here or come see the Carter's own Diana on view in the main gallery! Stay tuned next week for more recent museum interiors, including some very familiar faces. The Carter's newest exhibition, Views and Visions: Prints of the American West, 1820–1970 opens this coming Saturday and features over 100 prints and book illustrations from the permanent collection. 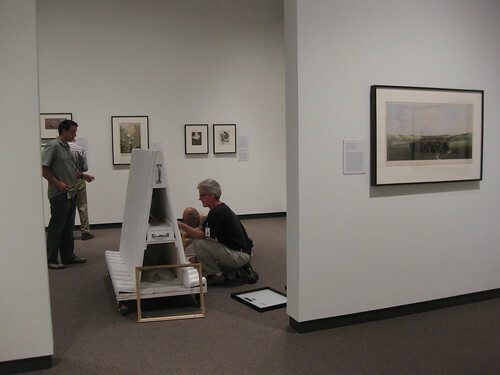 Shows drawn from the permanent collection generally require more behind-the-scenes work from Carter staff; unlike traveling exhibitions where the artworks often arrive framed and ready for installation, works from the Carter's collection must be matted, framed, labeled, and so on. It's a complicated process that takes months - and most museum staff in some capacity - to do properly. Speaking of which, here is a peek behind the scenes of the Carter staff getting ready for the big Views and Visions opening later this week. 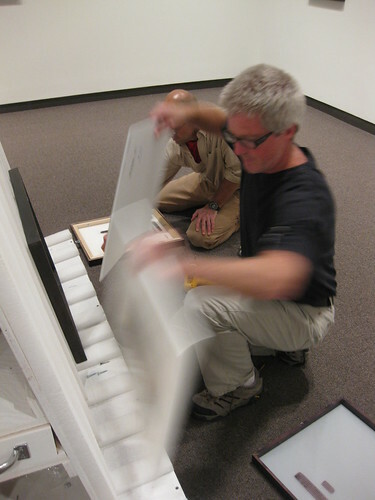 An action shot of preparators Steve and Les working very quickly to attach backings and hangers to the last two prints. Jazz By the Boulevard kicks off tonight right next door to the Carter, so this installment of Photo of the Week draws images of artist-musicians from the Laura Gilpin archive in the Carter's photography collection. Gilpin's close friend, sculptor Brenda Putnam (1890-1975), is seated at the piano. Laura Gilpin, Randall Davey, gelatin silver print, 1947; Bequest of the artist, © 1979 Amon Carter Museum. Randall Davey (1887-1964) was an American painter who exhibited in the pivotal 1913 Armory Show. A student of Robert Henri and friends with John Sloan, he was also a self-taught cellist. Davey relocated to Santa Fe, where Gilpin took this portrait in 1947. Have you noticed the recent articles in the New York Times about staged photographs, specifically the veracity of Robert Capa's famous Falling Soldier photo? As this NYT blog post and anyone who deals with historical photographs can tell you, photographers 'enhancing' their subject matter is nothing new. This is the same photograph described in the second NYT link. Gardner made the mistake of taking two photographs of the same soldier in different locations. This 'outdoor' scene was set up inside the photographer’s studio! Edited to add: This photo is on view in the Carter's photography galleries until January 2010 as part of the exhibition Masterworks of American Photography: Moments in Time. This medium’s slow exposure speed tells us this fight is staged – "action" shots were impossible with the technology of the time. You may have noticed there was no Photo of the Week for last week. We were undergoing a major behind-the-scenes upgrade to the Carter website and didn't want to lose any blog posts! I'll make it up to you this week with a super-sized Photo of the Week with extra images, celebrating the first week of school here in Fort Worth! I'd never noticed until this morning just how many photographs of workers there are in the Carter's collection. And not just photos of exciting outdoor work, but people sitting at their desks...going back to 1847! Because we're all so excited about the unseasonably un-miserable weather lately, this installment of Photo of the Week features an unusual view of a rainy day. Special thanks to registrars Melissa and Lacey for helping choose this photo from hundreds of contenders. The moon has been a source of inspiration for artists for ages, and it is a common theme in the Carter's collection. In honor of the 40th anniversary of the moon landing on Monday, our Photo of the Week features some charming, pre-space-race depictions of the moon from the photography collection: postcards from the moon! Spooning in the Moon is not currently on view, but you can see two more recent interpretations of the moon at the Carter right now: Louise Nevelson's Lunar Landscape, currently installed in the permanent paintings and sculpture galleries, and Moon Face (Cara de Luna), now on view in the exhibition Rufino Tamayo: Tamarind Lithography Workshop. Check out this nice article in the Fort Worth Star-Telegram about the Carter's new photography acquisition, Edward Curtis’s The North American Indian portfolio set (previously here and here). Today marks the anniversary of the first atomic weapons test in 1945. This first test took place in New Mexico; extensive atomic testing was also done in Nevada and Washington state, which is the subject of this week's photos by Nevada photographer Peter Goin. Yucca Lake is a nuclear test site in the Nevada desert -- only 65 miles from Las Vegas -- where a shocking 739 tests were performed between 1951 and 1992. This particular photograph shows the aftermath of above-ground nuclear testing, but apparently underground testing at the site also created craters large enough for the Apollo 14 astronauts to use for training. Hanford was a huge nuclear reactor in Washington state that produced the plutonium used in the first atomic test in New Mexico, tests at Yucca Lake, and the bomb used at Nagasaki in World War II. The plant stopped producing plutonium in the 1940s, but with 53 million gallons of nuclear waste still at the site, it is considered to be the most contaminated nuclear site in the United States. But why is this photograph called "Burial Ground"? The last reactor at Hanford was shut down in 1987, and since then most of the structures have been "cocooned" and buried here in the desert.